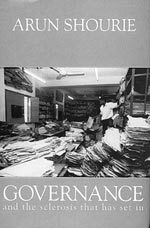 For anyone who has dealt with the government, or is in the government, or is likely to encounter the many faces of babudom -- probably every living Indian within the physical boundaries of this country -- this book is an absolute must-read. The government intrudes into our lives, sometimes unobtrusively, but most often abrasively and without apologies: the traffic police officers who are never there when the traffic lights fail, the factory inspector who travels in corporate cars to conduct 'inspections' and the men and women who love sending files in slow, jerky movements from one desk to another till hope is replaced by anger and depression. All that's at the micro-level. At the macro-level, there are cabinet decisions on critical issues such as the environment, disinvestment or on internal security matters or Kashmir and northeast India. The story is pretty much the same here: the system rising in absolute defiance against all efforts to shake up the status quo. Arun Shourie brings to his work an immense capacity for absorbing detail as well as credibility; as an editor, he worked phenomenally hard and was a tough taskmaster. He was known for his fight against authoritarianism and consistent opposition to the Congress Party, particularly the Gandhi family. In his relentless campaigns against corruption through The Indian Express and India Today, he shook the establishment with one expose after another. He was awarded the prestigious Magasasay award and then moved to the Bharatiya Janata Party (bjp), becoming the minister of state for planning in the National Democratic Alliance government and then the minister of development for the Northeast -- he proved the most capable and distinguished of all three who held that post. Then it was to the high-power ministries of disinvestment and technology that he moved, rapidly becoming one of the most visible faces of India's changing economy and its rushing embrace of 'globalisation'. His years in government This immensely detailed work reflects his years in the government. Shourie hones in on the usual and the unusual but tears apart the fabric of what makes government tick -- or rather what makes it fail. And the stumbling block is that simple word, so often used but little understood: governance. The book opens with an hilarious episode which highlights how obnoxious babudom is: a simple issue about which officer is entitled to sign with a green-ink pen, and which with a red-ink pen, involves years of chase through a bunch of ministries and over countless desks. Shourie then goes after the usual and not-so-usual villains in his scheme of things. The Communist Party of India (Marxist) in West Bengal -- which is wooing capitalism with a capital c -- is a favourite target for it has destroyed the public sector in the state, despite its so-called commitment to the people. There is reflection on how trade unions have effectively blocked privatisation of white elephants in the public sector, such as that of the Indian Tourism Development Corporation hotels, by harassing, intimidating and physically abusing those who came to examine and bid for them. On the environment Shourie spends a significantly long segment on the horrors of the environment and the persistent failures and deliberate roadblocks to change. Three chapters and 57 pages are devoted to issues as wide-ranging as abattoirs in Delhi, water contamination and pollution control. There are copious references to publications of the Centre for Science and Environment, New Delhi. He lists eight actionable points, which are as valid for other segments of governance as for the one on environment.It is worth noting a few: a long-term and coherent set of policies; punishments should be substantial and enforcement honest; alternative technologies should be available easily and that measures that are "decreed should be actually enforced". bjp and the Asom Gana Parishad (the regional party in Assam) about threats posed by illegal Muslim immigration in Assam. He also argues that the Northeast is being swamped by a Muslim wave. Illegal movement of people is a fact. But the pattern of these movements is not as simple as suggested by the official reports on which Shourie depends. To see this as a great conspiracy by Islamic forces in Bangladesh, to opine that every madarsa is a training centre for fundamentalists is too simplistic. The reality is the failure of governments, at every level, to understand the problem and develop ways of dealing with it. There is another reality, familiar to those of us who have researched at the field level in both Bangladesh and the Northeast. The people in this area -- both Muslim and Hindu -- are poor but an enterprising lot. They are moving out in search of a better economic life to the United States, Europe and Southeast Asia. Fences and laws do not keep out migrants; a better standard of living at home does. We need to ensure this in partnership with Dhaka. But the problem is that our neighbour officially parrots the same old line: that there is no migration to India and those being pushed back are Indian Muslims! Identity cards for all residents of the region (of course, also across India) could be a workable solution. This must be followed by issuing temporary work permits for those wanting to cross borders. This would enable people from Bangladesh to come and work for brief periods, at the same time making their monitoring easier. This would also ensure that such people are not given settlement and voting rights -- supporters of illegal movements in the region are doing that right now! The book is rich in detail, but is also a tad repetitive. But then, Shourie sees every problem in black and white; there are no shades of grey for him.